In the 50 free, Tetzloff busted out a new best time as she powered to a 22.08 to top the field by almost a full second. Day 1 of the 2018 Auburn Invitational is now in the books. Swimmers competed individually in the 500 free, 200 IM, and 50 free tonight, while some teams also competed in the 200 free relay and 400 medley relay. 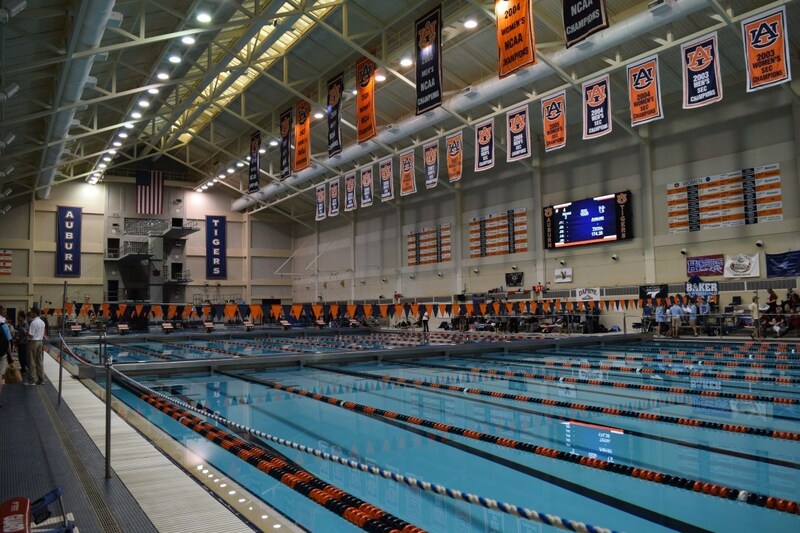 The Auburn women came up with a pair of wins courtesy of Aly Tetzloff and Zoe Thatcher. In the 50 free, Tetzloff busted out a new best time as she powered to a 22.08 to top the field by almost a full second. Her former best was a 22.17 done on a relay leadoff at the 2017 NCAA Championships. Thatcher’s win came in the 200 IM. She used her speed up front to take the edge, never giving up her lead as she touched in 2:00.21 for the win. Florida State freshman Hailey Ladd brought home a win and a new best time with her performance in the 500 free. Ladd set the pace early on, holding on to her lead as she turned in a 4:52.79 for the win. That took nearly 4 seconds off her former best, which stood as a 4:56.57 from the 2017 Georgia Tech Invite in November. On the men’s side, Florida freshman Santiago Corredor put up a big personal best in the 500 free. Though he trailed Alabama’s Evan Heldman (4:21.63) halfway, Corredor kicked it into another gear to take control of the race and build a big lead to win it in 4:18.90. That marked his first ever swim under the 4:20 barrier. His best before tonight was a 4:22.05 from the 2017 Purdue Invitational in November. Fellow Florida freshman Erge Gezmis ran down Heldman in the last 100 to take 2nd in 4:21.07. Gezmis dropped over 3 seconds from his former best done at the Purdue Invite, while Heldman dropped nearly 6 seconds from his best time. Florida State’s Rudo Loock was just off his best time in the 200 IM, picking up a win in 1:47.91. Auburn’s Hugo Morris also picked up a win for his team in a close 50 free battle. He hit the wall in 19.90, just out-touching Alabama’s Braxton Young (19.91) and Florida’s Viktor Toth (19.98). That was a career best and first time under 20 for both Young and Toth.